Hollister Wound Drainage Collector with Barrier Small, Translucent Non-Sterile, with Cut-to-Fit FlexWear Barrier, Drain Valve and Access Window Small, Reclosable Cap, Without Starter Hole, For Wounds up to 3"
Hollister wound drainage collectors are cost effective alternatives for the management of draining wounds, fistulae or draining wound sites. All wound drainage collectors are made with odor-barrier plastic, a convenience drain, and a unique reclosable cap that permits access to the wound site without removing the pouch. Protects periwound skin; exclusive cross-linked skin barrier absorbs exudate and adheres/conforms to body contours. 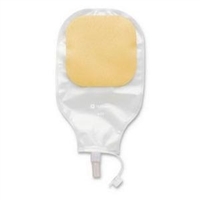 Keeps patient dry and comfortable by collecting exudate, eliminating odor and conforming to the wound site. 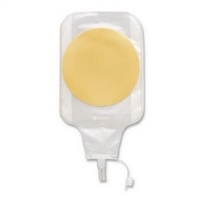 Easy to use and cost effective; cut the skin barrier to fit the exact wound size/shape; stays in-situ up to 7 days. Bacterial, viral and odor barrier. Hollister Wound Drainage Collector with Barrier Small, Translucent Sterile, with Cut-to-Fit FlexWear Barrier, Drain Valve and Access Window Small, Reclosable Cap, Without Starter Hole, For Wounds up to 3"
Hollister Wound Drainage Collector without Barrier Medium, Translucent, Sterile, with Drain Valve and Access Window Medium, Reclosable Cap, Without Starter Hole and Skin Barrier, For Wounds up to 3-3/4"
Hollister wound drainage collectors are cost-effective alternatives for the management of draining wounds, fistulae or draining wound sites. All wound drainage collectors are made with odor-barrier plastic, a convenience drain and a unique reclosable cap that permits access to the wound site without removing the pouch. HHollister Wound Drainage Collector without Barrier Large Translucent, Sterile, with Drain Valve and Access Window Large, Reclosable Cap, Without Starter Hole and Skin Barrier, For Wounds up to 4" x 8"
Hollister wound drainage collectors are cost effective alternatives for the management of draining wounds, fistulae or draining wound sites. All wound drainage collectors are made with odor-barrier plastic, a convenience drain and a unique reclosable cap that permits access to the wound site without removing the pouch. 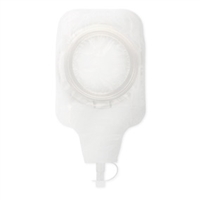 Hollister Wound Drainage Collector without Barrier Large Translucent, Sterile, with Drain Valve and Access Window Large, Reclosable Cap, Without Starter Hole and Skin Barrier, For Wounds up to 4" x 8"